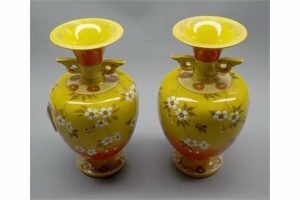 A pair of Japanese Satsuma earthenware vases of yellow ground decorated with cherry blossom, early 20th century. 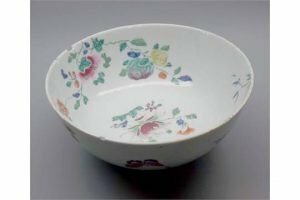 An 18th century Chinese famille rose porcelain bowl, typically decorated with blossom and bamboo amidst rock work. 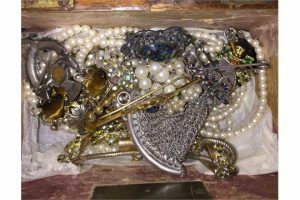 A quantity of dress jewellery to include a Victorian gold bar brooch, pearls, chain mail purse etc. 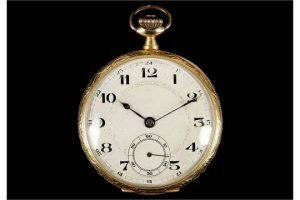 A late 19th century, continental 18ct gold cased open faced pocket watch, with silvered dial, Arabic numerals, sub-seconds and the case back with engraved and engine turned heart and central oval cartouche. 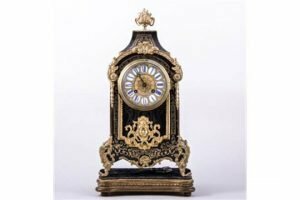 A French Boulle work and ebonized mantel clock, probably late 19th Century, cast gilt metal appliqués, enamel numerals, French cylinder movement, striking on a bell, set on a gilt plinth. 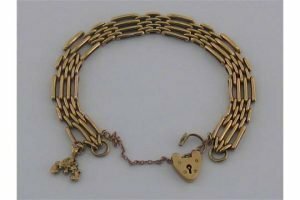 A 9 carat gold gate bracelet, approx 19cm long, 18.5 gms. 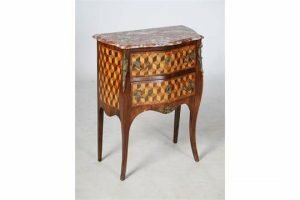 A late 19th century French kingwood, parquetry and gilt metal mounted commode, the red and white marble top above two long drawers, raised on tapered cabriole supports with gilt metal mounts. 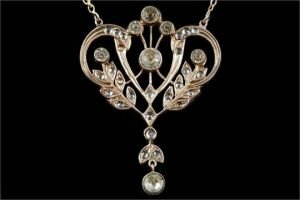 An art nouveau low carat gold foliate scroll pendant, set with paste stones and suspended from a 14ct gold chain. 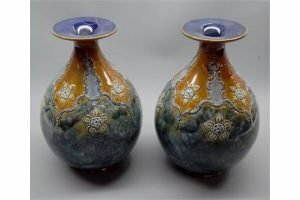 A pair of Royal Doulton stoneware squat baluster vases, decorated with stylised foliage, impressed marks to base. 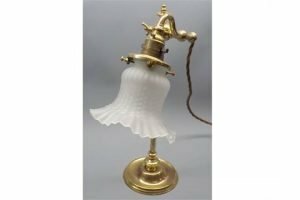 An early 20th century brass desk lamp, with frosted glass shade, raised on a circular base. 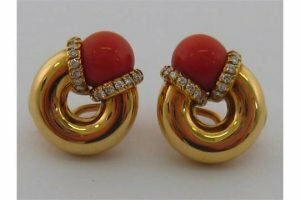 A fine pair of coral and diamond ear clips, stamped 750 for 18 carat gold, the corals of fine colour each measuring approx 9mm diameter, earrings approx 2cm, 13.7 gms. 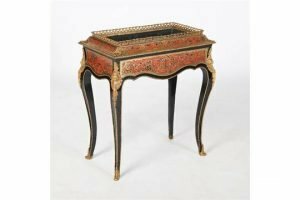 A late 19th century ebonized Boulle work jardiniere stand, the rectangular top with metal liner and pierced Vitruvian scroll gallery, raised on four tapered cabriole supports with mask and foliate cast mounts trailing to scroll cast sabots. 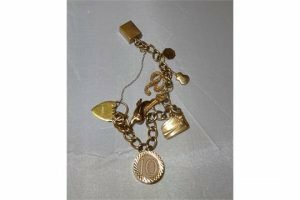 A gold charm bracelet with various charms to include a lighter, dolphin, notes, guitar. 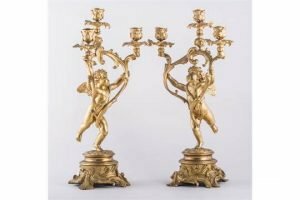 A pair of Louis Philippe style gilt metal three light candelabra, modelled with cherubs, on circular bases. 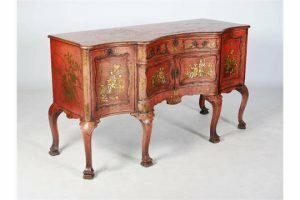 A late 19th/ early 20th century red lacquer chinoiserie style serpentine sideboard, the shaped top decorated with gilded and silvered figures, fenced gardens, flowers, bamboo and pavilions, above a central concave frieze drawer and pair of panelled cupboard doors flanked by a pair of cupboard doors, raised on six cabriole supports. 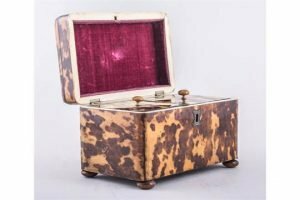 A Regency tortoiseshell oblong shape tea caddy, domed lid, white metal stringing, two section interior on bun feet. 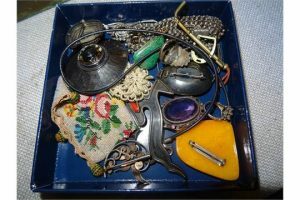 A quantity of vintage dress jewellery to include a beaded purse in the 18th century style, silver and amber brooches, bracelets etc. 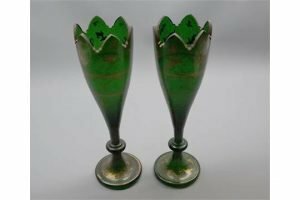 A pair of 19th century continental green and gilt decorated glass vases, of tapering form. 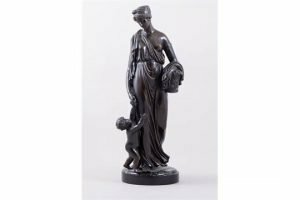 A French bronze figure Classical maiden and child the woman holding a basket of grapes on a coloured and Belge Noir marble plinth. 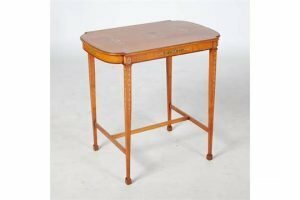 An Edwardian painted satinwood occasional table, the rectangular top centred with circular roundel enclosing lyre, flanked by floral garlands and ribbon tied foliate swags, raised on four tapered square supports with rectangular feet, united by H-shaped stretcher.